Monkeys & Dragons is an Indie Retro Adventure inspired by video game classics like Monkey Island, Indiana Jones and Simon the Sorcerer. 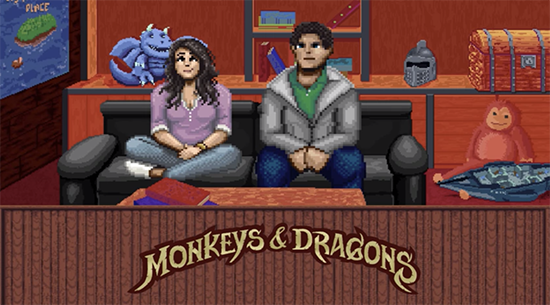 Monkeys & Dragons uses lovely 8-bit Pixel Art graphics to tell Lana's adventure. The game uses classic Adventure genre elements like item combinations, puzzles, funny dialogs and references to any kind of pop culture from the last three decades. The big difference between Monkeys & Dragons and other Adventure games is that the ending is not written yet and players will decide how the game ends! The game is going to be released as Early Access title on 14th December on Steam. The game will launch with three chapters that tell the story of Lana and how she becomes an adventurer and rescues her husband. However, the story has an open ending with a cliffhanger. Players will be able to discuss how the story shall end. The best idea(s) will be implemented as final chapters before the game gets its final release.